Cape May's birdwatchers have been out counting birds this week, all in the name of research. Last Sunday saw many of the nation's birdwatchers taking part in the 115th annual Christmas Bird Count (CBC), organized by the National Audubon Society and, as ever, there were surprises in store on the Cape May count. These counts don't set out to produce a precise count of every last bird in the area - that would be nigh on impossible. Rather, the figures collected over time provide us with an idea of long term trends; an indication as to whether species are increasing or decreasing. In addition, because winter bird populations can move around from year to year, and because the counts take place across the whole continent, any local changes that might be detected can be put into context. In other words, a localized drop in numbers for one species may not mean that it is declining; the species may simply be wintering somewhere else. Such long-term trends are helping to produce valuable data - data that is based on sound information, rather than guess work. One bird that has been intriguing in its behavior so far this winter is Bonaparte's Gull. Despite being a regular, even common, wintering bird around the coastline of Cape May County, not a single Bonaparte's Gull was logged on the Cape May CBC - a surprise to everyone. Is this a local trend or a wider phenomenon? It will be interesting to review the results of all the 2014 Christmas counts once they are in and compare them with those of previous years. It seems very unlikely that the species has suddenly drastically declined, so what is going on? But CBCs can produce surprising guest appearances as well as noticeable absences and this year's Cape May count was no exception. Not all results are in yet, but by the last count, some 160 species had been reported within the 15-mile diameter circle that makes up the Cape May count. Among these were certainly a few surprises; Ross's Goose, Cackling Goose, Eurasian Wigeon, Osprey, Northern Goshawk, Northern Bobwhite, Western Kingbird, Blue-headed Vireo, Pine Warbler, Vesper Sparrow and American Tree Sparrow were all nice bonus birds, while the Black-capped Chickadee that turned up last winter made it onto this year's count, constituting the first modern count record of the species. Top prize went to Michael O'Brien, who found a Magnolia Warbler lurking in the back streets of West Cape May - the first time the species has been recorded on a Cape May CBC. While the Cape May CBC is, of course, dear to our hearts, there was another reason to be out counting with great anticipation this week - this year's Avalon Seawatch was fast approaching the magical one million birds mark for the season. That wonderful milestone was reached on Monday, when Skye Haas and Tom Reed watched a female Black Scoter break the tape and become the millionth bird counted so far. There has been much celebration and Skye has posted a great report on the moment on our Seasonal Research blog. But the season is not over yet and you still have a few more days to enjoy the often impressive spectacle of birds heading south along the barrier islands. Bonaparte's Gulls have shown some interesting behavioral swings in 2014; while wintering birds have yet to appear at the back end of this year, birds in the early half of the year seemed reluctant to leave and first-year, non-breeding birds could still be found in South Jersey well into May. The above birds were photographed at East Point, Cumberland County and were part of a gathering of some 50 birds there on May 13th. Though no adults were present, even first-summer birds such as these would be expected to be north of our area well before this date [photo by Mike Crewe]. Tom Reed cut a lonely figure at the Avalon Seawatch today, as gusty Northerlies and a stormy sea added an extra dimension to the task of counting birds. Though such conditions sometimes create interesting birding opportunities, seabirds were pretty noticeable by their absence this morning and much of the offshore movements involved a variety of scoters, Common Eiders, Long-tailed Ducks and Common Loons scuttling for cover in Townsend's Inlet. Nearby sports fields held parties of Brant and roosting Herring Gulls, while Boat-tailed Grackles search the wrack lines for food - but the wrack lines were in the middle of the road! A trip around the barrier islands around high tide on a Nor'easter certainly helps to demonstrate just how fragile our coastlines are and just how important it is to understand how these dynamic, natural systems work, such that we can protect both ourselves and the natural world to the best of our abilities. Certainly, the value of the wave-absorbing sand dunes along the coast was clear to see as rising waters washed right across Stone Harbor Point, leaving a scattering of beachgrass-topped, dune islands. Nummy's Island had an unfamiliar look too, as waves lapped at both sides of the road running across its middle. Many years ago, before we knew any better, the natural dunes at Cape May Point were deliberately removed, to allow the nouveau riche of the time to enjoy splendid views of the bay from their homes. After a number of disastrous floods - at least in part as a result of this beach removal - the dunes were replaced and the lesson learned. The weather is likely to stay blustery for the next couple of days at least so it will be interesting to see what comes our way; with the Avalon Seawatch count hovering around 960,000 for the year, it would be nice if we can have a good run of birds over the coming week and see the magical one million figure reached - we'll keep you posted! 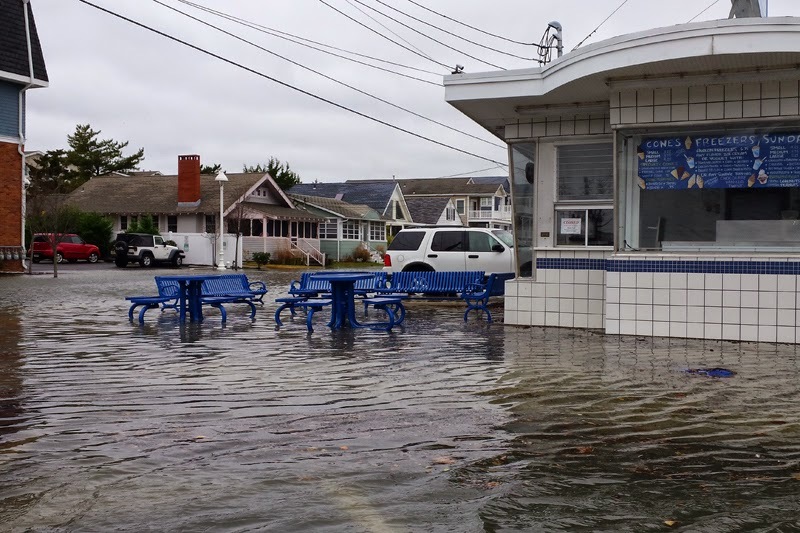 The 8th Avenue jetty was completely submerged at high tide today, with just the post at the far end sticking out of the turbulent waters [photo by Mike Crewe]. The road to the bridge across Townsend's Inlet is closed at present, which was a good thing as the storm surge pushed waves high over the breakwater and onto the road [photo by Mike Crewe]. Avalon can be a very different place in the winter to the tourist-filled resort it becomes in summer. Streets on the backbay side of the barrier islands - such as here at 23rd and Dune - can become inundated with saltwater during high storm surges [photo by Mike Crewe]. Sand dunes absorb a lot of the storm force that pushes onto land during a Nor'easter, but the beaches can be a dangerous place at this time [photo by Mike Crewe]. If you fancy birding in less exposed locations, the two Ross's Geese were still feeding contentedly beside the entrance to the Cape May Ferry Terminal [photo by Mike Crewe]. Wet woods at this time of year can be worth checking for Rusty Blackbirds - these four were part of a flock of 15 or so in the Red Maple swamp at the Rea Farm on Sunday. Rusty Blackbird populations are showing a worrying long-term downward trend and keeping accurate notes of observations of this species will add to our knowledge and perhaps help us to understand what is going on [photo by Mike Crewe]. The weather has been something of a roller coaster ride over the past six weeks or so. After an all-too-early chilly snap made us think that winter was arriving very early, things warmed up a little and we were relieved to have avoided the snow at Cape May. The following milder spell has, however, now skipped off south and we are seeing a return to chillier conditions. After a rain-drenched day yesterday, a blustery day of cold, north-west winds brought clear blue skies today and Vince Elia was the first to scan the skies over the Rea Farm and pick out a Golden Eagle. Indeed, this morning, the skies over Cape May Point were worthy of October, as packs of Turkey and Black Vultures streamed high overhead and, at one point, I counted 15 Red-shouldered Hawks, spread out from Cape May Lighthouse to somewhere over the Rea Farm. 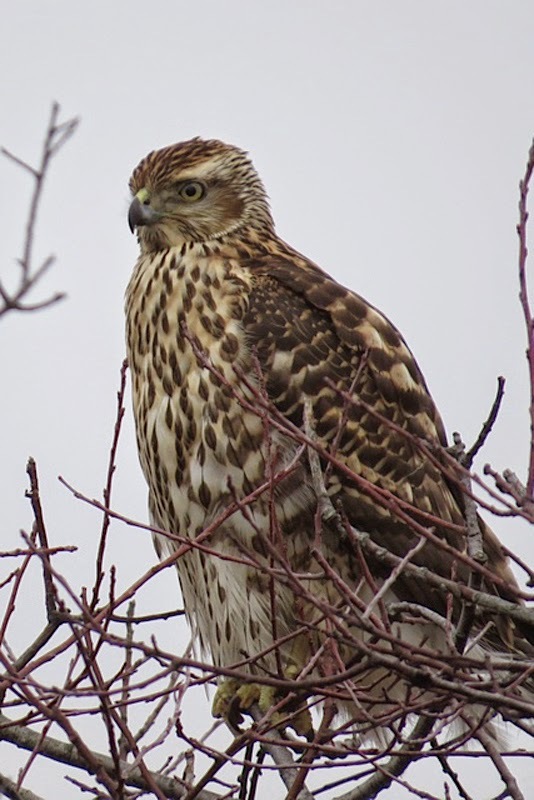 Among them came a few Red-tailed Hawks, Cooper's Hawks and even a late Sharp-shin. As temperatures drop further north, perhaps most noticeable around Cape May Point is the increase in the number of waterbirds, especially at TNC's South Cape May Meadows. The rather sorry gathering of poorly, resident Canada Geese, has now been joined by hyperactive, chatty, migratory Canada Geese. These latter birds will probably mostly continue south to winter in the more open landscapes of the Delmarva Peninsula, and southward even to Florida. 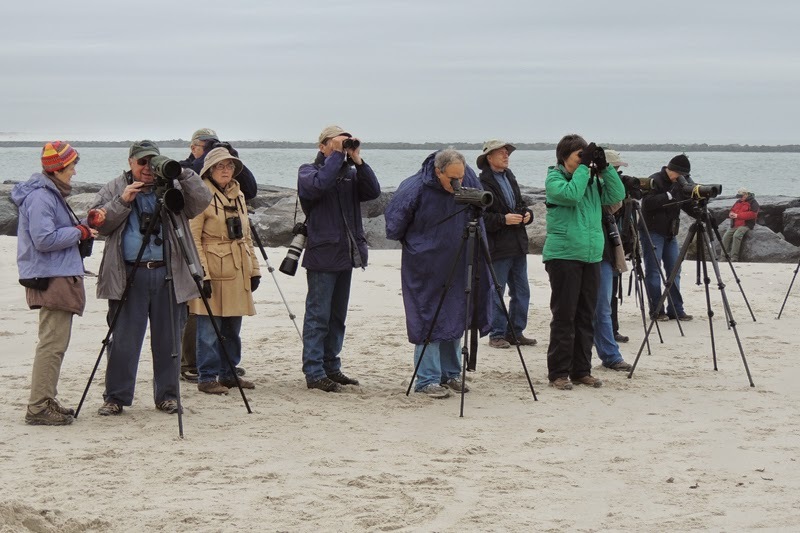 But their passing through Cape May is a time of interest for local birdwatchers, as these busy flocks often bring other things - not least of which is controversy. Many species of ducks, geese and swans are popular in both public and private collections and - unfortunately - such birds are prone to escaping. Despite much discussion over perhaps too many pints of beer, there really seems to be no clear way to tell if an odd waterbird is genuinely a rare migrant, or if it is a wire-hopper - an escape from captivity. At the Meadows, three Greater White-fronted Geese are surely wild - though this species largely flies south down the Central Flyway to winter along the Gulf Coast, a few birds stray into larger flocks of Canada Geese and head southeast to hit the Atlantic Coast and make for a nice addition to a winter's day birding. In contrast to the Whitefronts, there is usually far more controversy whenever a Ross's Goose turns up. This diminutive relative of the Snow Goose turns up regularly on the east coast, though its main migration routes from High Arctic breeding grounds largely mirror those of the Greater White-fronted Geese. Though Ross's Geese are not uncommon in captivity, there is reason to believe that at least some birds are genuine vagrants; the problem really comes when two adults turn up together, on their own rather than in a large flock of Canada or Snow Geese; then proceed to feed unconcernedly on a median divide right outside the Cape May ferry terminal - as happened yesterday. Not only that, but one of the birds has lost an eye. Another area of controversy among goose aficionados came to a head when the familiar Canada Goose was 'split' by taxonomists into two species - now known as Canada Goose and Cackling Goose. In short, the small, High Arctic breeding populations became Cackling Geese, but it's not that easy. The two 'species' overlap greatly in a number of ways - including size - and there remains much controversy as to the true identity of a number of 'small Canada Geese' that pass our way at this time of year. Currently, a party of seven of these small geese are hanging out at the Meadows; not for us a bunch of classic, dinky winky birds but some annoyingly intermediate 'Lesser Canada Goose' type things. If head shape, bill size and shape, breast color and scapular patterning can all be assessed accurately, you might be in with a fighting chance of identifying them, but the amount of variation does suggest that there could well be interbreeding between the various forms going on. If only life were perfect! Personally, I found it just as interesting that there was clearly a large increase in the number of Mallards on the ponds around the point today. The Mallard is an ever-present, semi-domesticated species that we readily take for granted and it is all too easy to forget that there are genuine wild Mallards out there, heading south from boreal breeding grounds. Finally, it was wonderful to see a family group of three Tundra Swans at the Meadows today - two silver-gray youngsters and an adult. This species gets a tough time in our area due to bullying by the all-too-common, introduced Mute Swan. Luckily, the Meadows still offers a brief respite from this and the three Tundras were resting up, no doubt before continuing southward a little further for the winter. Winter is creeping up on us - the species range is dropping, but the number of birds can be dramatic at times - wrap up warm and come and enjoy the birds! Though resting safely away from human disturbance, these Tundra Swans can easily be picked out from the local Mute Swans. At all ages, they have a longer head profile and show a shorter tail. 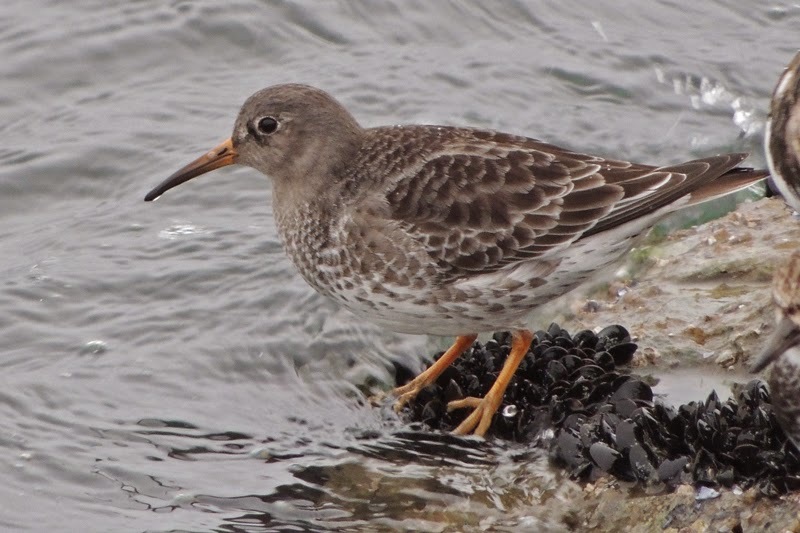 Adult (left bird) have an all black bill with often just a small yellow flash at the base, while juveniles are a soft, dove gray color [photo by Mike Crewe]. Our recent Black Friday walk provided us with this American Pipit as one of our highlights on South Cape May Beach. Though this is a common migrant here, getting good, close views is not always easy and brief fly-overs are more often the norm [photo by Mary Watkins]. 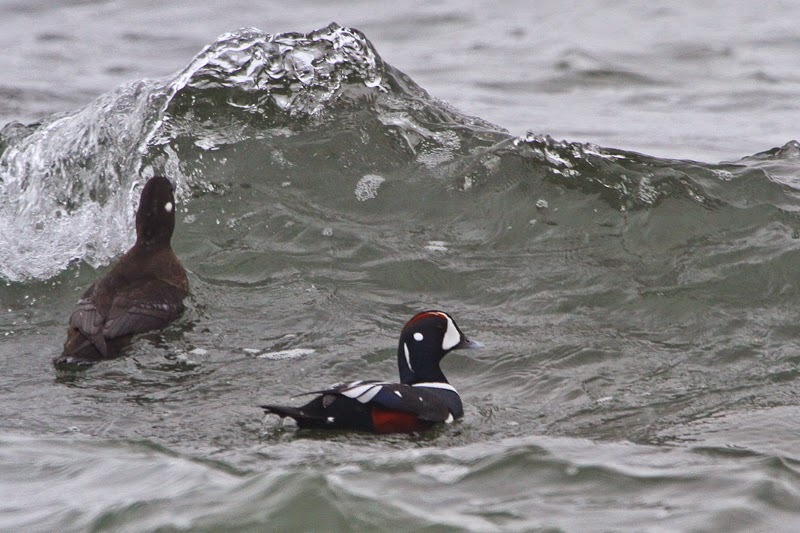 ...followed by surf-dodging Harlequin Ducks - a life bird for several members of the group [photo by Mike Crewe]. As December kicks in, we find that the focus of attention at Cape May can shift away from the better known locations in the less-populated parts of the county, and into our very own streets and backyards. Going for a walk around the block during the winter can net you almost as many bird sightings as you might get if you headed out to the backbays - and you may well chance upon some nice finds. Last winter was a good case in point, when Rufous Hummingbird, White-winged Dove and Painted Bunting could all be seen at yard feeders around Cape May Point within a short distance of each other. Aiming for even greater heights, it was back in 2010 when New Jersey's first Broad-tailed Hummingbird was located in a Cape May back yard. In the short time that my wife and I have lived in Cape May, we have enjoyed such crazy birds as American Woodcocks, Bald Eagles, Eastern Meadowlark, Dickcissel, and even Crested Caracara in our yard! Back yards and urban areas in general can be popular with birds during the winter for a variety of reasons. In largely agricultural regions, they can offer oases of cover and feeding opportunities among the berrying trees and bushes that we plant; our feeders offer sustenance during times of difficulty, while densely populated areas can even be several degrees warmer in winter than the surrounding countryside. Through December, we continue our Saturday walks at Cape May Point, but you may find attention on these walks shifting from the open habitats of the state park, to the secluded corners of Cape May Point back yards. In January, we start a new walk for you - Warren Cairo leads a trip that takes you out from CMBO's Northwood Center (where you are invited to come and start the event with a hot cup of coffee!) and takes you to an assortment of locations according to local conditions. But, at this time of year, you can bet that many of these walks will find us looking at birds in and around Cape May's streets and back yards! A quick drive to town to get something for lunch was interrupted when Mark Garland reported this White-winged Dove from his West Cape May back yard. Keep an eye on Mourning Dove flocks at this time of year and see what you might find lurking there [photo by Mike Crewe].